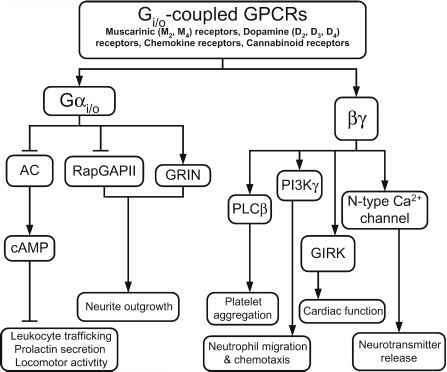 The oligomerization of GPCRs has been studied using many different approaches. Biochemical and biophysical approaches both have provided strong evidence to support the existence of GPCR dimers or oligomers. However, the different methodologies have advantages and disadvantages that need to be considered when deciding which technique is to be used in the investigation of receptor-receptor interactions and also when interpreting the findings obtained from applying different approaches. Biophysical techniques, such as FRET and BRET, provide a powerful means to study GPCR oligomerization. Unlike biochemical techniques such as co-immunoprecipitation, they are performed in intact cells and do not require receptors to be extracted and solubilized from cell membranes, which can often lead to artifactual receptor aggregation. Resonance energy transfer techniques are strictly distance-dependent, with energy transfer only occurring between donor and acceptor molecules less than 100 A apart. Because the structure of rhodopsin predicts that the center-to-center distance between monomers in a dimer would be approx 40 to 50 A (92,93), such biophysical techniques are ideal for monitoring these interactions and their modulation in living cells. Unlike FRET, BRET does not require an excitation light source, with donor energy derived from a bioluminescent reaction. This eliminates the associated problems of autofluorescence, photobleaching, cell damage, and signal loss. Furthermore, the subsequent reduced background fluorescence of BRET makes it a highly sensitive technique for detecting weak or low-level protein-protein interactions. This may be an important consideration, because many studies of GPCR oligomerization have involved the overexpression of receptors in heterologous expression systems. It has been suggested that GPCRs have a natural tendency to form dimers or oligomers upon co-expression in heterologous expression systems, and studies need to be performed in cells that endogenously co-express the receptors (94). However, this is not always possible, thus it is advantageous to perform high-sensitivity assays with receptor expression levels at near physiological levels, as has been done recently using BRET (77,86,91). The problem of nonspecific receptor-receptor interactions caused by heterologous receptor overexpression can also be reduced through the use of receptor controls. An interaction between two receptors has often been shown to be specific by using additional receptors that show a lack of interaction. In the case of BRET, nontagged receptors can be used to specifically compete out receptor-receptor BRET signals (71). ful, enabling this relatively simple technique to detect endogenously expressed GPCR dimers and oligomers.